I know, I know, so much for all the drama, you'll say (see: previous post!). I guess I just can't stay away from my (awesome) blog anymore! My blog winning under two categories in Blogjunta's BOIB 2010, and one of my posts being selected in Blogadda's Spicy Saturday Picks was no help! Yay, me! But I don't like to brag, so let me move on to the part where I tell you how the last post wasn't all drama. Have you seen that episode of True Blood where Sam crushes the maenad's heart in his hand? Before every exam I feel like someone's doing that to me. Retarded, I know. But now that the exam tension is wearing off, I can gradually see all the little drops of creativity obediently return back to me. Having one day to spare before the stress for the next, more important exam, I went back into my reading mania, for the last 24 hours! I finished reading Small Gods (from the Discworld series, of course!) and 'I, Robot' by Isaac Asimov. Then I went and hit my head on a wall for several minutes for being stupid enough to not have read 'I, Robot' before. 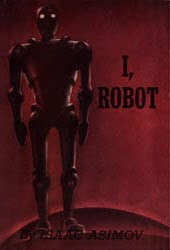 'I, Robot' is a collection of different short stories, with one connecting link: Dr. Susan Calvin. She is a robopsychologist at U.S Robots, and the novel is in the form of stories that she is narrating to a reporter. Each of the stories revolves around the interaction between man and machine and the efforts made by men to make superior robots. This is where the Three Laws of Robotics come into picture. Most of the stories have the same basic plot; something is not right with a particular robot, and everytime they have to fix him by taking into consideration these three laws. The book shows the evolution of robotics, from the time when there were the primitive robots who couldn't even talk, when the world wasn't ready for them yet, till the time when robots were used to manage interplanetary affairs! It has everything right from a robot who can read minds to a religious one who refuses to believe that there was no force higher than mere humans involved in his creation! The book also gives an insight into human nature, specially with respect to our growing dependence on technology, something all of us can relate to! While the book is amazing to read, it falls short on the literary front. It is written in simple language, and is easy to understand. That is great, but it is too simple at times, and it makes you feel like you are reading a text book instead of a novel. There are no vivid descriptions of anything, and a bit too much is left to the imagination! As you know, my creativity was still on its way back to me, so what were probably supposed to be cool, glossy, towering, futuristic-looking robots, looked like enlarged Wall-Es in my mind's eye! A little more use of adjectives would have helped me! But that hardly mattered compared to the rest of the book! The stories were just plain amazing. I obviously plan on reading the entire Foundation series, but maybe later. Till then, do make it a point to read this book, if you haven't already! P.S.- For an 'Illustration & Design' category blog, this sure has a lot of book reviews. Next time, I'll write something artsy, definitely!! You're going too fast for me! I haven't even started on the Discworld series and here you go recommending a new book! By the way, you should give the Hitch Hiker's Guide series a try. The first book is growing on me. I know!! I want to read HHGG, but if I start now, I will soon mysteriously die (read: aai will kill me, literally)! 'I, Robots' is short, only 150 pages!! But still you have to put it after Discworld, obviously, on your To-be-read list!! Lol! SS: Don't listen to Priya. She has been "Busy Reading" War and Peace since I moved to Gurgaon. And HHGG is better than Discworld. @Soniya, I thought we already established the fact that you were *not* the one who made me read I, Robot; but it is still awesome!